I’m Done, I’m Done, I’m Done with Level 1! I just attended the #National PE Institute in Asheville, NC where I had the opportunity to witness my vision of Elementary P.E. perfection! Jim DeLine’s first session, Go Green, Go Lean, Assessment Routines was supposed to focus on ways to assess cognitive knowledge without a paper and pencil; but it was very clear that there was much more to learn from this session than assessments. Jim’s classroom is filled with imaginary, evil, wellness robbing, villains like; Sherriff Lazy Bones, Sinister Supersizer, the Fat Cats, and Couch Potato Au Gratin. Through the use of these amazing characters, complete with accents, Jim is able to weave wellness, anatomy, and nutrition concepts into any skill centered lesson. For example, in the football unit, his team, the Scotties, are trying to conquer the Fat Cats by using plays that require pantomiming fitness activities. Classroom management in Jim’s world is clearly defined and hysterically funny. Expectations are scripted with a teacher statement and a student response. For example, instead of a whistle or a freeze, Jim says “Hey team!” and the students respond with “Hey Coach!” and then turn and face the teacher. Granted, Jim has a football coach/military/comedian way of saying things to grab your attention; but the premise is simple, have the students show that they have heard the command with a verbal and/or physical response that draws the attention of all the students in the gym. Brilliant! The feeling in Jim’s gym is that you are part of a team and you have an important role in it. If you’re sitting out, you will be asked to do the wave, be a coach, or gather equipment. You got the impression that your individual presence made a difference to the team. The pace of the class was quick and expectations were high. The reason you felt that you were part of the team was that your individual contribution did not go unnoticed. Positive reinforcement was both verbal and demonstratively physical! A great pass during his “Think Outside the Ball- What’s in Your W.A.L.L.E.T” session would not only get you a heartfelt “Great Pass!” but also a class wide Cha-Cha Dance. The final activity of his last session was called the William Tell Overture. I’ll be using it as the opening ceremony to my field day this year. 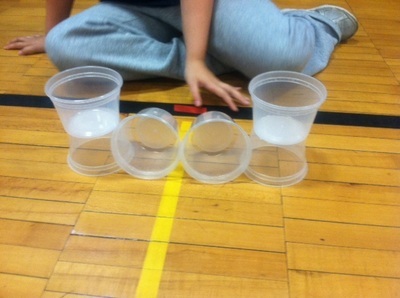 This activity is a full class concert of rhythmic movement with a message. 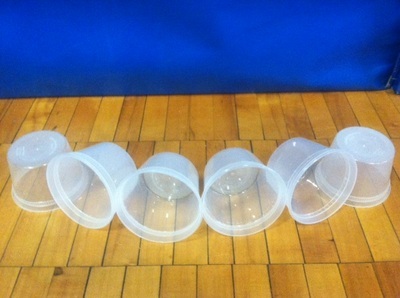 Jugglers represented the juggling of priorities and the importance of Physical Education. The ball handlers represented the importance of children’s health/well-being and our determination to not to drop the ball. Ribbon dancers represented the need to wave the flag in support of quality Physical Education and the stretch bands represented the need to stretch the budget to include P.E. I could go on and on with best practice ideas, assessments, interdisciplinary concepts and Brain, Academic, Movement Activities but I try to keep these blogs under two pages! I promise to blog about him again after he presents at our local APHERD conference. Here is his webpage: http://www.gym-solutions.com/. I don’t know what he costs but he is worth every single penny. We have a new puppy. Being a basketball family, we decided to call her “Buckets.” She is an adorable little Chocolate Labrador Retriever. Over these first few weeks of parenthood, I am constantly reminded of my Southdown students as we begin the process of socializing her into our household. One of the greatest things about having a dog and being an Elementary PE teacher is that I always feel like a rock star. Every single time I walk into the house, Buckets wags that whip-like tail back and forth and pounces forward to give me kisses. Likewise, my elementary school students will hang out of bus windows; yell down the hall or run across the playground to get my attention. It’s like being Beyonce without the paparazzi. However, while my dog will continue to treat me like royalty no matter what I do, it is incumbent upon me as the teacher to foster a continually positive relationship with my students. Buckets loves to have her tummy rubbed. We use cute little “baby talk” when we want her to do something and we pat her head when she does something terrific, like going out her doggy door. Thankfully, physical education is one of the only areas of education where touching students is still acceptable. High fives, a pound or a turkey are all positive touches P.E. teachers and coaches use to acknowledge student performance. (High five- open palm to open palm, Pound- fist to fist, Turkey- wide open hand to fist.) A simple gesture with a “Duchene Smile” goes a long way to making students feel special when they have done something terrific. I try to encourage my students to use them as well. Somehow, with puppies it is easy to be positive. Teaching hundreds of children every day can sometimes bring out the negative in even the Mary Poppins of teachers. I read somewhere that you need to say 10 positives to every one negative. I don’t know if there is any science behind that but I believe the sentiment to be true. Here is a trick that I use every now and then. I take 10 pennies and put them in my left pocket at the beginning of the class. Every time I make a positive statement to a student, I move a penny to my right pocket. I can use this personal reminder with the whole class or with that one student that I find myself having difficulty staying positive with. I know there are some people that are against tangible rewards. I myself am not a fan of the “everyone gets a trophy” concept; however, there is no denying that Buckets and my students respond to the smallest cookie or trinket. I try to save the tangible rewards for special occasions. I also believe it is important to wean both Buckets and my students from extrinsic motivators once they understand the behavior that is expected. I like to use stickers, certificates, life size pictures (see Wall of Champs) and any of the freebies I have picked up from AHPERD conventions. We had Buckets for less than a week and she was going out of her dog door and “doing her business” outside. What proud parents we were. I posted to Facebook and bragged about how brilliant our little girl was until she did her “business” in the dining room during the second week. Whether it is as simple as not completely understanding the expectations or whether it is attention getting behavior, our puppies and elementary school students sometimes regress. I find it happens a lot just before or right after a vacation with my students. The expectations at home are not always the same as they are at school. I once sat through a lecture about how we need to understand the culture that our students are coming from and adapt our programs to their culture. I can understand and appreciate where my students are coming from; however, just as we expect everyone in society to modify their behavior when they walk into a religious building, a museum, or a library, I believe we should expect our students to abide by the rules of behavior in our educational setting. Regression can be expected. I believe in reteaching respectful, responsible and safe behavior in the physical education setting and keeping standards high. Buckets has sharp as razor baby teeth and she loves to use them! We give her a stern “No” and replace with a biting appropriate toy. In my classroom, I try to reprimand using “the look” first. I can’t really describe “the look” but it seems to work for most students. I also try to use humor without sarcasm to defuse a situation when possible. 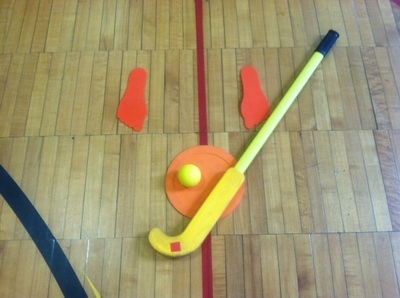 In physical education, I think we are lucky in that all sports use some kind of negative reinforcement to deter rule infractions. I will explain to students that in hockey a penalty results in time spent in a box watching the rest of your team play without you. In basketball, the other team might get a free shot at the basket. 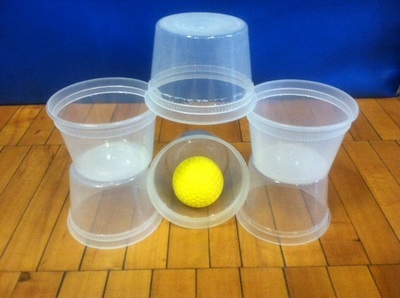 Setting up negative reinforcers in PE makes sense. I often use the term, “sitting out for safety,” when I feel that a student is being a danger to himself or others. While I believe that there should be concrete, consistent, appropriate consequences for inappropriate actions in the gymnasium, I also believe it should be one of the tools used and not the only tool in your toolbox. Remember the definition of insanity- “Insanity is doing the same thing over and over again, but expecting different results.” If all you are doing is punishing and it is not changing behavior, you need to try something else! Buckets is now 11 weeks old! She is house trained, can come, sit and shake… when she wants to! Just like my students, learning to be socially appropriate takes time and practice. Some students will pick up social cues just by watching, while others will need structured instruction and practice. For these students, patience and a plan are necessary. As you enter next year and a new group of students, may you be prepared with a behavioral plan, have the patience to stay positive and faith in your students. At risk of showing my age, I could spend hours watching the Flintstones and Gilligan’s Island as a child. Countless episodes of shameless soap operas like the Guiding Light were viewed in college, Thirty-Something and the Wonder Years post-college, ER and any number of laugh-out-loud sitcoms during my child raising years. Recently, something has changed and I just can’t zone out anymore. It may be because my home is filled with ESPN watching, remote controlling men, but I suspect the more accurate reason is I just don’t find television mentally stimulating anymore. Instead, I find myself searching for new things to learn and do. I am still on the couch in front of the TV but my computer is humming between Twitter, Linkedin, Gmail and Facebook. I could go hours reading what people are doing around the world in their PE programs but even more satisfying is learning something new and using it to develop something for my PE program or the NYS AHPERD Suffolk Zone. Over the past couple of years, I have taught myself how to publish books using Indesign and upload them to Amazon, format ebooks for Lulu.com, develop websites using Weebly, create an Eboard for my students, download and convert videos from Youtube to music for my Ipad, create videos using Powerpoint presentations and countless other things that just seem to become necessary. It is absolutely amazing to me that if you need to get something done, all you have to do is ask someone in a social networking forum or Google it! I have been on summer vacation for less than a week now. While I have set goals to paint the bedroom and fix countless things around the house; working on teacher resources, starting a Twitter account for the Suffolk Zone, developing a PE app for Southdown, setting up a QR code for my school website and getting started on my physical education professional developments sound much more appealing. Here are the PD’s I have so far. I think some of you will be interested in joining in. If anyone out there has any other great PD’s, please send them along! Now, it’s time to get up off the couch, play with my new puppy “Buckets” and go for a bike ride! Have a great summer! I love equipment! I want as many students engaged at a time as possible, so if I have a class of 60 students and we are working on dribbling a basketball, I am going to have 60 balls. Some will think I am crazy blowing up 60 balls for one or two weeks and then deflating them, however, I believe that if you want students to learn a skill, then repetition is the key to success. I can’t understand having long lines of students waiting for a turn when there are balls in the closet collecting dust. I find waiting your turn to be a green flag for students to misbehave. I am also somewhat of an equipment snob! If I had my way, every item of equipment I own would be in rainbow colors. Not only do I find it visually pleasing and motivating, I also feel it adds structure to the class. The Dilemma- This is my second year at Southdown Primary. For those of you that team-teach, you will understand that in the beginning it’s like being thrown into a fixed marriage. You have to figure out how to live with your work spouse. Compromise is the key. Thankfully, after two years I think we are really starting to find our groove. We don’t agree on everything but we respect each other and find a way to make it work. So here’s the thing. We have very limited space for the equipment that I love and cherish. And, just like at my home, I have no use for things that serve no purpose. For example, I have no patience for a ceramic rabbit but I am okay with a candle or a vase. Thus my battle over the one hundred and forty plastic soup containers my co-worker has collected that are taking up room that could be occupied by my precious, store bought, and colorful equipment! I moaned and groaned until I succeeded on having them moved to the very back of the hidden compartment under the stage in the gym. Until….field day. We designed a mural for field day to represent Curious George Feeds the Animals. We needed to find a lot of Frisbees to use as food for the animals. Thus, the tops to the soup containers were excavated from the catacombs and decorated as bananas. Begrudgingly, I had to admit, Sportime and Gopher could not have supplied a better alternative. After field day we started track and field. We were having a spectacular unit when Mother Nature hit us with a forecast of 5 days of rain! Our gym is too small to run a meaningful track unit indoors. 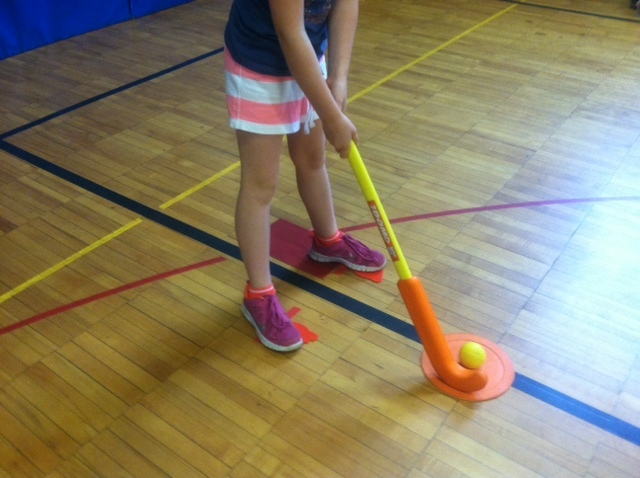 With only 8 mats to teach jumping with, we decided on combining the field event long jump with the beginning of our golf unit- putting. We set up 8 standing broad jump stations and 8 putting stations. When I dug through the equipment, I was dismayed to find we only had 5 irons and no putting greens! Field hockey sticks made the perfect putters, but what to do for holes? You guessed it! Soup cups! 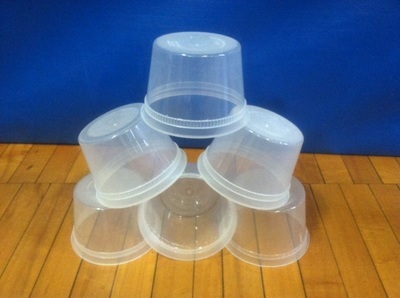 These plastic, colorless, bane of my existence, cups were the most fun, exciting and creative piece of equipment we have used since the noodle! Groups of 2-4 students took turns creating the equivalent of a miniature golf hole. 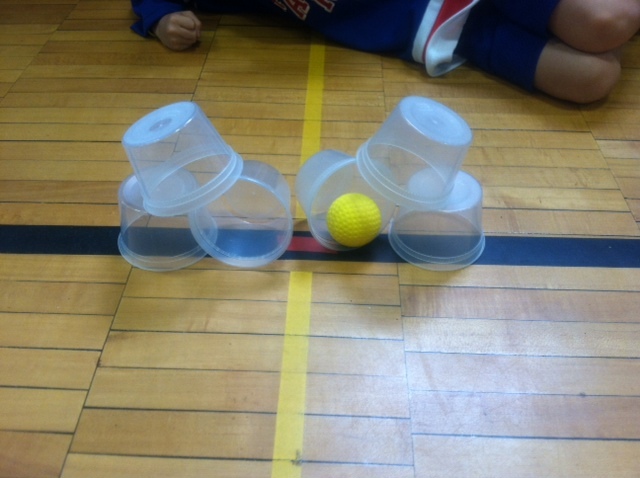 Each student took a turn trying to putt into the design and then the design was changed to create the next hole. Students kept score: 1 stroke for a hole in one, 2 strokes if it hit the structure and 3 strokes if it missed entirely. 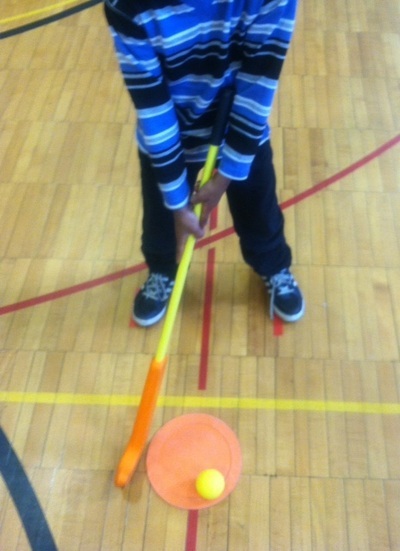 Every student was engaged in authentic math calculations, hole creation or putting. If we had manicured commercially produced putting greens there would have been students waiting without purpose. Not a single behavior issue all week. Brilliant!! !